Marilyn (Roseberry) Hupp, age 82, went to be with our Lord peacefully on Monday, August 14, 2018 of natural causes in the care of Community Hospice Truman House surrounded by her family. Born December 5, 1935 in New Philadelphia, she was the daughter of the late Earl and Vena Roseberry. Marilyn attended Midvale High School and was a lifelong homemaker who mothered more than just her own children. Mom was well-known for her phenomenal baking skills, and more specifically her apple pies and cinnamon rolls. We have all been taught her baking secrets but have never been able to master her homemade touch. Marilyn, a life-long Democrat, who loved painting ceramics, reading, and spending time on the porch enjoying nature and her many grandchildren. 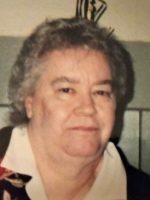 Marilyn was a loving mother to four remaining children, Debra Musick of Uhrichsville, Jeffrey (Shonna) Hupp of Homosassa, Fl., Beverly (Ray) Blake of New Philadelphia, and Kimberly (Jeremy) Ketchum of Roy, Washington. She will be sadly missed by 18 grandchildren Becca, Zach, Chrystal, Eric, Brian, Shawn, Jeffie, Teresa, Katie, Shaylynn, Tristan, Chuck, Dave, Richie, Christopher, Jeremy, Kristi, and Josh, 34 great-grandchildren and 5 great-great-grandchildren, a sister JoAnn Flynn of Oklahoma and three sisters-in-laws Nancy Lawver, Ann Hupp, and Shirley Roseberry, all of New Philadelphia. Marilyn was preceded in death by her husband of 57 years, Donald Gene Hupp, Sr., twin daughters, Carol Ann and Sue Ann, and son, Donald Gene Hupp, Jr., as well as three brothers, David, Danny and Jimmy Roseberry. A Funeral Service for family and friends will be held on Sunday, August 19, 2018 at 1:30 PM in the Geib Funeral Center at Dover with Rev. Brian Flood officiating. Visitation will be from 12:30 to 1:30 PM. The family invites those who wish to share their memories to attend a fellowship meal immediately following the memorial service in the Geib Center. The family would like to express a special thank you to Mom’s physician, Dr. Ahmed; Faye Campbell and Laura Vestal of A to Z Home Healthcare and Melinda Keim and Bethany Thompson of the Community Hospice Truman House of New Philadelphia.